This is the second blog post in our series on deploying NGINX Plus as an API gateway. Unlike browser‑based clients, individual API clients are able to place huge loads on your APIs, even to the extent of consuming such a high proportion of system resources that other API clients are effectively locked out. Not only malicious clients pose this threat: a misbehaving or buggy API client might enter a loop that overwhelms the backend. To protect against this, we apply a rate limit to ensure fair use by each client and to protect the resources of the backend services. In this example, the limit_req_zone directive on line 8 defines a rate limit of 10 requests per second for each client IP address ($binary_remote_addr), and the one on line 9 defines a limit of 200 requests per second for each authenticated client ID ($http_apikey). This illustrates how we can define multiple rate limits independently of where they are applied. An API may apply multiple rate limits at the same time, or apply different rate limits for different resources. Then in the following configuration snippet we use the limit_req directive to apply the first rate limit in the policy section of the “Warehouse API” described in Part 1. By default, NGINX Plus sends the 503 (Service Unavailable) response when the rate limit has been exceeded. However, it is helpful for API clients to know explicitly that they have exceeded their rate limit, so that they can modify their behavior. To this end we use the limit_req_status directive to send the 429 (Too Many Requests) response instead. We can update the definition of the Warehouse API to accept only these two HTTP methods in requests to the pricing service (and only the GET method in requests to the inventory service). With this configuration in place, requests to the pricing service other than those listed on line 4 (and to the inventory service other than those on line 13) are rejected and are not passed to the backend services. NGINX Plus sends the 405 (Method Not Allowed) response to inform the API client of the precise nature of the error, as shown in the following console trace. Where a minimum‑disclosure security policy is required, the error_page directive can be used to convert this response into a less informative error instead, for example 400 (Bad Request). Part 1 in this series described how to protect APIs from unauthorized access by enabling authentication options such as API keys and JSON Web Tokens (JWTs). We can use the authenticated ID, or attributes of the authenticated ID, to perform fine‑grained access control. Let’s say we want to allow only “infrastructure clients” to access the audit resource of the Warehouse API inventory service. With API key authentication enabled, we use a map block to create a whitelist of infrastructure client names so that the variable $is_infrastructure evaluates to 1 when a corresponding API key is used. In the definition of the Warehouse API, we add a location block for the inventory audit resource on lines 13–19. The if block ensures that only infrastructure clients can access the resource. Note that the location directive on line 13 uses the = (equals sign) modifier to make an exact match on the audit resource. Exact matches take precedence over the default path‑prefix definitions used for the other resources. The following trace shows how with this configuration in place a client that isn’t on the whitelist is unable to access the inventory audit resource. The API key shown belongs to client_two (as defined in Part 1). As defined above, the pricing service accepts the GET and PATCH methods, which respectively enable clients to obtain and modify the price of a specific item. (We could also choose to allow the POST and DELETE methods, to provide full lifecycle management of pricing data.) In this section, we expand that use case to control which methods specific users can issue. With JWT authentication enabled for the Warehouse API, the permissions for each client are encoded as custom claims. The JWTs issued to administrators who are authorized to make changes to pricing data include the claim "admin":true. This map block, added to the bottom of api_gateway.conf, coalesces all of the possible HTTP methods into a new variable, $request_type, which evaluates to either READ or WRITE. In the following snippet, we use the $request_type variable to direct requests to the appropriate Warehouse API policy, /_warehouse_READ or /_warehouse_WRITE. The rewrite directives on lines 9 and 14 append the $request_type variable to the name of the Warehouse API policy, thereby splitting the policy section into two. Now different policies apply to read and write operations. Both the /_warehouse_READ and /_warehouse_WRITE policies require the client to present a valid JWT. However, for requests that use a WRITE method (POST, PATCH, or DELETE), we further require that the JWT includes the claim "admin":true (line 35). This approach of having separate policies for different request methods is not limited to authentication. Other controls can also be applied on a per‑method basis, such as rate limiting, logging, and routing to different backends. By default, NGINX Plus rejects requests with bodies larger than 1 MB. This can be increased for APIs that specifically deal with large payloads such as image processing, but for most APIs we set a lower value. The client_max_body_size directive on line 19 limits the size of the request body. With this configuration in place, we can compare the behavior of the API gateway upon receiving two different PATCH requests to the pricing service. The first curl command sends a small piece of JSON data, whereas the second command attempts to send the contents of a large file (/etc/services). The js_set directive defines a new variable, $validated, which is evaluated by calling the json_validator function. The json_validator function attempts to parse the request body using the JSON.parse method. If successful, then the name of the intended upstream group for this request is returned (line 6). If the request body cannot be parsed (causing an exception), then a local server address is returned (line 9). The return directive populates the $validated variable so that we can use it to determine where to send the request. In the policy section for the Warehouse API, we modify the proxy_pass directive on line 24. It passes the request to the backend API service as before, but now uses the $validated variable as the destination address. If the client body was successfully parsed as JSON then we proxy to the upstream group as normal. If however, there was an exception, we use the returned value of 127.0.0.1:10415 to send an error response to the client. When requests are proxied to this virtual server, NGINX Plus sends the 415 (Unsupported Media Type) response to the client. The directives on lines 20 and 21 control how NGINX Plus handles the request body internally. We set client_body_buffer_size to the same size as client_max_body_size so that the request body is not written to disk. This improves overall performance by minimizing disk I/O operations, but at the expense of additional memory utilization. For most API gateway use cases with small request bodies this is a good compromise. As mentioned above, the mirror directive creates a copy of the client request. Other than populating $request_body, we have no need for this copy so we send it to a “dead end” location (/_NULL) that we define in the top‑level API gateway entry point. This location does nothing more than send the 204 (No Content) response. Because this response is related to a mirrored request, it is ignored and so adds negligible overhead to the processing of the original client request. In this second blog post of our series about deploying NGINX Plus as an API gateway, we focused on the challenge of protecting backend API services in a production environment from malicious and misbehaving clients. NGINX Plus uses the same technology for managing API traffic that is used to power and protect the busiest sites on the Internet today. 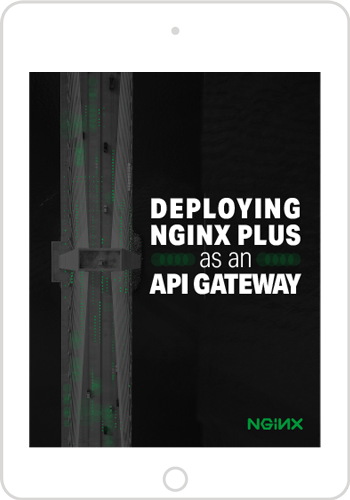 To try NGINX Plus as an API gateway, start your free 30-day trial today. Use the complete set of configuration files from our GitHub Gist repo.